Chad: how are things on your end? William: soft, hairy. I moisturize. and only the finest cotton/synthetic blends for maximum softness. Yep, that's right, we are recording soon. Got it scheduled. The topic is multiple-DM campaigns. We're looking for your thoughts and experiences on this: send us your experiences as a player or DM a multiple-master session or an entire campaign. Whether you were hot-seating, co-hosting, alternating running NPC's and monsters, splitting a large party up, running different tables in the same story, co-guiding a PBP campaign, we want to hear it! What was important to remember when part of a multiple DM campaign? What were some successes or benefits? What were some downfalls, problems? Did combat work any differently? 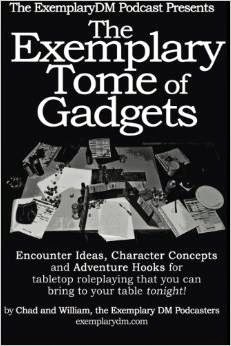 Did roleplaying work any differently? How did it all end? How long were you able to sustain multiple-DM scenarios? Drop your comments below, or email us at exemplarydm at gmail dot com. Or, if you're already blogged about such an experience, send us a link here, email, or even on our social networking engine of choice, Twitter.